A central bank can respond to deteriorating macro-financial conditions by using two broad types of actions. In a mainly passive response, the central bank provides liquidity to stabilise markets and promote lending. Such a reactive policy treats the problem at hand as a temporary financial disruption and does little to create confidence in future economic prospects. A more active response provides monetary stimulus through lower interest rates, which ‘puts money in people’s pockets’ and stimulates demand. Such active policies, if implemented with a clear strategic purpose, help generate greater optimism about the future and, hence, create the basis for more sustained economic recovery. Active policies include lower policy interest rates and, in a zero lower bound environment, forward guidance and the purchase of financial assets to lower the long-term interest rates. After the onset of the Global Crisis, all central banks quickly undertook passive action but the timing and pace of active action varied considerably. The US Federal Reserve reduced the policy rates sharply at the onset, in September 2007, and then, starting in December 2008, began forward guidance and asset purchases. In contrast, the ECB waited until October 2008 for its first interest rate reduction and thereafter injected active stimulus only hesitantly. Of the ECB’s liquidity interventions, a crucial component was the provision of dollars obtained through swap operations with the Fed. In a recent paper, we have developed a new empirical framework to identify bond and equity markets' causal responses to the ECB's policy interventions between October 2009 and September 2012, the most intense phase of the euro area crisis (Mody and Nedeljkovic 2018). The framework has three elements. First, we identify policy interventions as the daily changes in policy indicators that are orthogonal to contemporaneous news releases and the public information about the state of the economy on the policy announcement days. In other words, the policy measure under consideration is a ‘surprise’, with potential to influence financial markets over and above the influence of other relevant information. Second, we study the changes in the conditional distribution of the bond spreads of financially distressed euro area ‘periphery governments (Greece, Ireland, Italy, Portugal, and Spain). For that purpose, we augment the quantile VAR (White et al. 2015) with the measures of policy interventions and additional confounding factors. Using a novel approach to estimating quantile response functions, we study not only the median response of the spread but, by examining the differences between the tail quantile and the median responses, we also ask whether markets perceived a likelihood of further decrease or, alternatively, a tendency for near-term increase in spreads. Finally, we examine the response of equity returns for all euro area countries and for broadly delineated industry returns in the FAVAR framework. This comprehensive approach – of studying bond spreads of stressed governments and equity returns – allows us multiple perspectives on the response of financial markets to ECB interventions. These perspectives help reinforce our statistical findings. We have built our analysis on and report results that are broadly consistent with an earlier literature (Krishnamurthy et al. 2017, Acharya, et al. 2018, Eser and Schwaab 2016, Ghysels et al. 2016, Rodgers et al. 2014). However, our enhanced empirical techniques covering both bond and equity markets deliver, we believe, more robust results, and analysis of different policy interventions within a consistent framework allows us to draw more ambitious policy lessons. The following are our findings on three types of policy interventions. In periods of significant dollar shortage, the Fed made dollars available to major central banks through several windows. The ECB then provided those dollars to banks in the euro area. We find that the provision of dollars lowered bond spreads of periphery country governments and shifted the bond market perceptions towards likely further decline in spreads. Simultaneously, dollar liquidity helped raise equity prices in most euro area countries, giving a special boost to the equity prices of banks. Supply of dollar liquidity was so successful because dollar shortage was a key vulnerability of euro area banks. The banks had financed their sizeable US dollar assets (amounting to roughly $3.2 trillion at the end of 2010) by issuing short-term unsecured dollar debt (certificates of deposits and commercial papers). The banks had also borrowed dollars through foreign exchange swaps. But dollars became increasingly scarce as the main holders of the short-term dollar debt, US money market mutual funds, faced large-scale investor redemptions amid growing concerns about the fragility of European banks (Mody 2018, Chernenko and Sunderam 2014). These redemptions caused a significant contraction in the total amount of available unsecured dollar funding, especially for the banks with larger sovereign exposure (De Marco 2018). The contraction in funding together with the rising cost of foreign exchange swaps created a serious risk for euro area banking operations. In turn, the stress felt by banks fed through to sovereigns, who were presumed liable for bank bailout costs. Hence, dollar liquidity proved crucial in stabilising the euro area's financial system, which also helped improve general economic prospects. 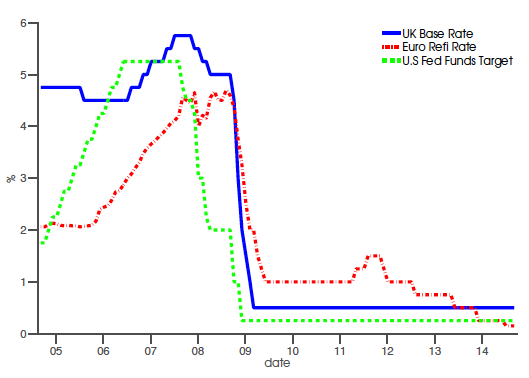 … while the provision of euro liquidity had limited effect. The ECB's euro liquidity measures marginally reduced median bond spreads for Portugal, Ireland, and Spain. However, the interventions also caused markets to worry bond spreads would soon increase. 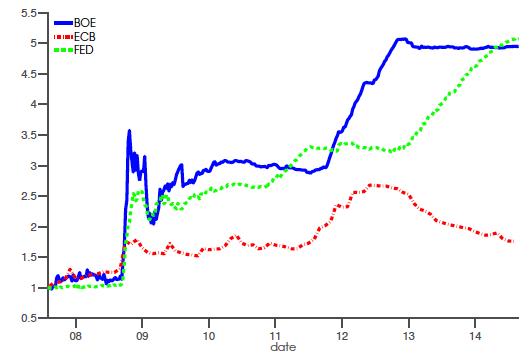 Moreover, ECB liquidity did not have a significant effect on equity prices. While euro liquidity was a potentially stabilising influence, the real constraint to the euro area's economic recovery was a lack of demand. Unable to lend profitably to healthy borrowers, banks used cheap ECB liquidity to engage in a ‘carry trade’ (Acharya and Steffen 2015, Drechsler et al. 2016). Especially in the periphery countries, banks used ECB liquidity mainly to buy their own government bonds, which were de facto risk-free but paid relatively high interest rates. Thus, banks’ purchases of government bonds helped improve their profitability and the increased demand for the bonds did help reduce the spreads, although to a surprisingly small extent. Yet, banks became more vulnerable because of their greater exposure to sovereign risk. Such deepening of the sovereign-bank nexus presumably pushed up the sovereign default premium that offset the greater demand for sovereign bonds. Finally, financial market participants understood that, in a demand-constrained environment, cheaper liquidity did little to stimulate demand and economic activity. Hence, the euro liquidity measures did little to raise equity prices. The ECB’s active measures before OMT led to a reduction in median bond spreads but they also led to a stronger perception that spreads on Greek bonds would immediately rise and spreads on Spanish, Portuguese, and Irish bonds would rise and remain elevated. Equity prices rose in several countries and industries, but not by a statistically significant degree. These observed reactions suggest that the markets were largely unsure about the ECB's strategy. The ECB conducted its purchases of government bonds through its Securities Markets Programme in a manner that lacked transparency. In addition, unlike the Fed, which maintained a steadily active monetary policy stance throughout the crisis period, the ECB raised its policy rate twice, in April and July 2011, before starting another round of policy rate cuts in November 2011. The rate cuts came well after signs of the deteriorating economy were evident and, hence, markets had reason to be concerned that the ECB may not sustain its actions. As a result, markets likely perceived that the ECB measures were a response to more bad news – markets also had no assurance that the ECB would sustain either its bond purchase or interest rate cuts. … while the OMT significantly improved market sentiment. In response to the OMT announcements, sovereign spreads declined substantially and the likelihood of a further fall increased. Equity prices also increased significantly, especially for banks. Compared to the earlier active measures, the OMT announcement was a substantial intervention. Although there were many legal ambiguities in the operation of OMTs, investors perceived them as a commitment to prevent default by a euro area government on its bonds. Nevertheless, OMTs have only been a promise, and the question remains whether they will work if eventually the need to deploy them actually arises (Mody 2018). Already, the ECB and the system of the euro area's national central banks have acquired substantial fractions of government bonds through its quantitative-easing bond purchase programme. There will be political limits to the amount of a country's bonds that the ECB could buy. For, if the stressed country were to default on the bonds purchased by the ECB, other member states would need to share losses as they replenish the ECB's capital. Such a concern would cause hesitation and delays, undermining the potential of OMTs. Dollar liquidity was a very particular need. By alleviating the dollar shortage, the Fed made a significant contribution to the euro area’s stabilisation. In contrast, the ECB’s euro liquidity to banks, by its very design, did little to create confidence in economic prospects. While the liquidity did bring temporary calm, it increased the risk-taking incentives of banks. The active, stimulative measures lacked clarity of strategy. Hence, markets had no reason to expect that such measures would continue, particularly since they often seemed to react to bad news rather than establish a forward-looking purpose. Not surprisingly, they did little to help. Acharya, V V, and S Steffen (2015), “The Greatest Carry Trade Ever? Understanding Eurozone Bank Risks”, Journal of Financial Economics, 115 (2), 215-236. Acharya, V V, D Pierret, and S Steffen (2018), “Lender of Last Resort, Buyer of Last Resort, and a Fear of Fire Sales in the Sovereign Bond Market”, Swiss Finance Institute Research Paper, 18-35. Buraschi, A, and P Whelan (2015), “Bond Markets and Unconventional Monetary Policy”, in P Veronesi (ed. ), Handbook of Fixed-Income Securities, 1 (6), 93-116. Chernenko, S, and A Sunderam (2014), “Frictions in Shadow Banking: Evidence from the Lending Behavior of Money Market Mutual Funds”, Review of Financial Studies, 27 (6), 1717-1750. De Marco, F (2018), “Bank Lending and the European Sovereign Debt Crisis”, Journal of Financial and Quantitative Analysis, forthcoming. Drechsler, I, T Drechsel, D Marques-Ibanez, and P Schnabl (2016), “Who Borrows from the Lender of Last Resort?”, Journal of Finance, 71 (5), 1933-1974. Eser, F, and B Schwaab (2016), “Evaluating the Impact of Unconventional Monetary Policy Measures: Empirical evidence from the ECB’s Securities Markets Programme”, Journal of Financial Economics, 119 (1), 147-167. Ghysels, E, J Idier, S Manganelli, and O Vergote (2016), “A High-frequency Assessment of the ECB Securities Markets Programmes", Journal of the European Economic Association, 15 (1), 218-243. Krishnamurthy, A, S Nagel, and A Vissing-Jorgensen (2017), “ECB Policies Involving Government Bond Purchases: Impact and Channels”, Review of Finance, 22 (1), 1-44. Mody, A (2018), Euro Tragedy: A Drama in Nine Acts, Oxford University Press. Mody, A, and M Nedeljkovic (2018), “Central Bank Policies and Financial Markets: Lessons from the Euro Crisis”, CESifo Working Paper No. 7400. Rogers, J H, C Scotti, and J H Wright (2014), “Evaluating Asset-market Effects of Unconventional Monetary Policy: A Multi-country Review”, Economic Policy, 29, 749-799. White, H, T-H Kim, and S Manganelli (2008), “VAR for VaR: Measuring Tail Dependence Using Multivariate Regression Quantiles”, Journal of Econometrics, 187 (1), 169-188.